Editor’s Note: This article is the first in a three-part series. Part 2 will appear next month. In this paper I will attempt a preliminary vision of a relocalization of food production designed to feed the population of Tompkins County. A project of this scope implies a reorganization of food processing and distribution that, while not included in this first iteration, will need to be integrated in a later, expanded overview. My purpose is to explore the kind of local food system that will be needed as this country faces sharply lower access to the energy sources on which our present industrial form of agriculture and food economy heavily depends. I will describe the types of local farming enterprises, farming methods, resources, and land use needed to confront a future of much lower energy use. A documented baseline assessment of current food production and county resources is not an objective of this essay, but will be essential to a detailed planning effort. The picture presented here is intended to be general enough to be useful in planning the relocalization of foodsheds that include an urban center the size of Ithaca, New York. In these first few pages, I will set out my premises and theoretical points of departure in some detail to explain the fundamental changes in perspective I think are necessary to envision how and where we produce food in the future. The premise underlying all work of TCLocal is that a permanent decline in the availability and affordability of liquid fuels and related rising costs of all energy sources will inevitably lead to much lower energy use and increasing importance of local scale in human affairs. The present long-distance food economy will shrink, and consumers will need to rely increasingly on local food production. This “energy descent” will force the transformation of food production toward low external input systems that rely more on human labor and models of healthy, highly productive ecosystem processes common in nature instead of the high energy cost technological substitutes on which agriculture, including most of organic agriculture, depends today. Our world is systemic in nature (parts are more or less connected), and this has important implications for attempts to change it. Problems we want to solve are, as the system analysts like to say, “structural,” and require intervention in several places. So the single-issue approach to any kind of change is eventually bound to fail to meet expectations. For example, dieting to solve weight problems never works for long if the problem lies in the structure of our life. In addition to changing what we eat, maybe trading the car in on a bike and some tools to dig the lawn into a vegetable garden would produce better results. Moreover, despite best intentions, in a systemic world we can never make just the one change we aim for. Complex systems are squishy like a balloon: squeezing just one end only makes the balloon blow out in other unexpected places. Change agents need a holistic approach that recognizes that consequences of any interventions are multiple ripple effects that go distant in space and time. This approach has important implications for design at every level of scale. At the garden or farm scale we want to build in multifunctionality, where parts of the system serve more than one purpose. Plants and animals that provide food, for example, may also provide ecological services necessary for the health and productivity of the whole. Ecological services are the benefits arising from the functioning of the ecosystem, in contrast to purchased inputs. At the level of the food system, where different elements of production, processing, and distribution can be designed as a cooperating whole, we need to build in complementarity as to what is produced, and services that are shared among the different types of production units to be described in this paper. Urban gardens may best serve the county food system by growing fresh produce, thus complementing rural farms that produce less perishable foods, for example. At the community level, we need to view the reorganization of the food system as affecting and affected by the reorganization of all other infrastructure and institutions impacted by reduced energy availability, e.g., industry, housing, markets, transportation, sanitation, information flow, knowledge production, etc. 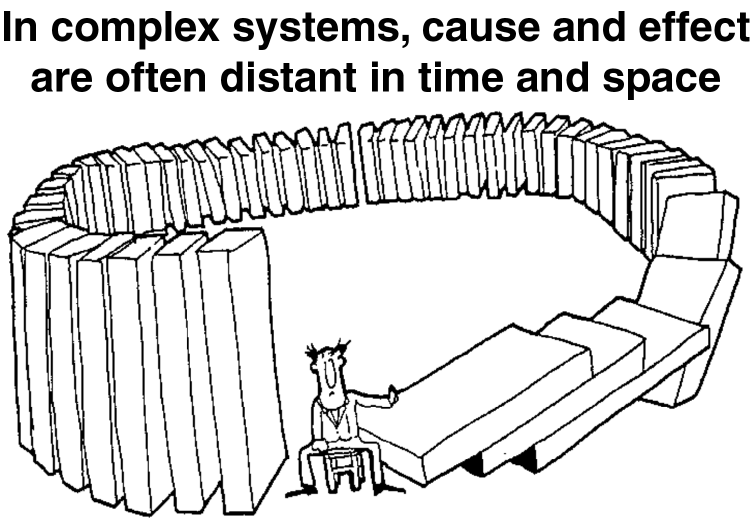 Most important from a systems perspective, we need to regard far-reaching changes like those to be proposed here as experimental, and track for unintended consequences in time and space. This approach, known to ecologists and other systems thinkers as adaptive management, requires constant monitoring and replanning in the face of uncertainty about consequences. The design of a relocalized agricultural system will need to address root causes. For example, the proximate causes of flooding may be failed riparian buffers and levees, but the root causes are pavement, bare ground, and other surfaces that create surface run-off, soils compacted and depleted of water-holding organic matter, agricultural field drains, and channeling that cuts streams and rivers off from their historic flood plains. 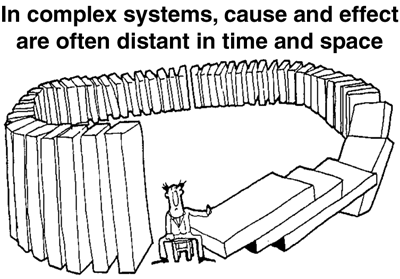 Attention to root causes forces the need for the systems perspective outlined in premise #3. If, from the viewpoint of sustainability, high-input, oil-dependent agriculture is now revealed to be a design failure from the outset, little is gained by piecemeal solutions like replacing chemical inputs with “natural” ones. Rather than the input substitution approach, efforts are better directed toward whole agroecosystem design that integrates a diversity of spatial and temporal elements. Understanding Sustainability. In addition to working from the stated premises, I want to ground the proposals in this visionary project in a working concept of sustainability based on ecological science. This is important at this historical juncture for a couple of reasons. The common practice of confusing and conflating sustainable agriculture and organic agriculture will be counterproductive in the coming era when shrinking access to cheap energy will reveal the unsustainability of most current forms of agriculture, including organic. The flowering of the organic farming movement, in which I have been a practitioner for 30 years, generated much innovation that will be useful in coming years. But it also produced the delusion of a luxury version of sustainability, because it occurred in and was shaped by an era of cheap oil. Limited by economic forces and a focus mainly on environmental issues, organic farming became more a matter of substituting “greener” inputs for those of industrial agriculture rather than seeking input independence through systematic redesign. Awareness that many of the “greener” inputs depend on fast-depleting, often finite, soon-to-become-expensive resources still has not penetrated the organic movement sufficiently to become a paramount concern. A common practice in organic vegetable farming, for example, is to import fertility in the form of compost from factory-style dairy and poultry farms. None of the above should be construed as an attack on the organic farming movement, or a dismissal of its contributions to the development of a truly sustainable agriculture. But we need a more rigorous design tool than “organic” to select from those offerings. Sustainability means that local food production systems must support the food and fiber needs of a given human population without exceeding their carrying capacity (CC). 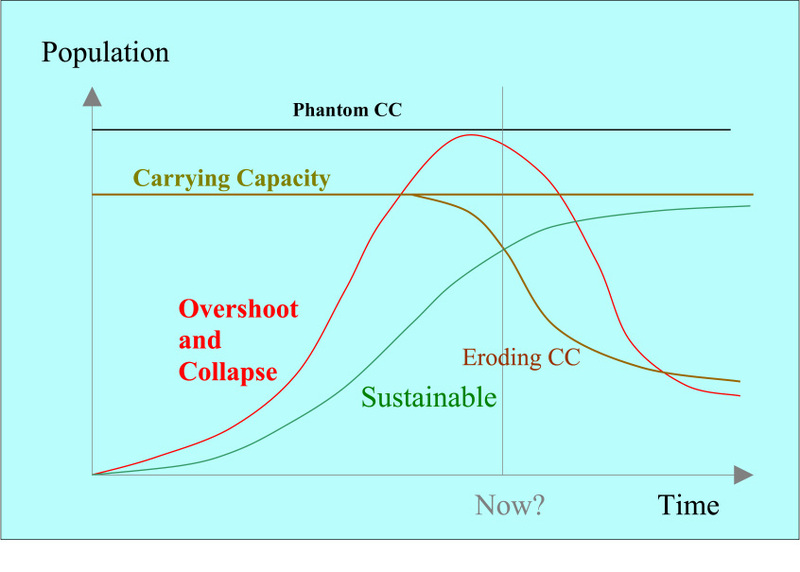 A working definition of CC might be the maximum indefinitely supportable ecological load of an ecosystem or area. We must be clear about what constitutes a supportable ecological load. Depletion of a finite resource like copper or phosphorus is not supportable unless we find a way to perfectly recycle as much of it as is needed (not downcycle it as in plastic bags --> park benches --> landfill). Petroleum products used for fuel are not recyclable, and anything needing those fuels in its production is therefore unsustainable. The supportable load on renewable resources on which we depend is limited to their refresh rate. The rate at which a farm consumes soil organic matter depends on the capacity of the agroecosystem to rebuild it. Less evident, but perhaps ultimately most important,is the load of work we place on natural systems to absorb concentrations of substances and handle imbalances that we create. That load can become insupportable, either because it becomes too great or because we weaken the ability of natural systems to do the work. In short, the success and survival of all human activity rests on and must be subordinate to the continuing health of the natural resource base and the ecosystems that underpin it. Encapsulated in the phrase, “Mother nature bats last,” this means that any sacrifice of ecological health to advance human affairs eventually results in losses to society. Economic profit gained in the short term at the expense of the natural resource base and its health leads inevitably to economic loss in the long term. The CC of a specific farm or regional landscape at a given historical moment may have eroded far below its potential. Industrial agriculture has indeed damaged the CC of much of the agricultural resource base. 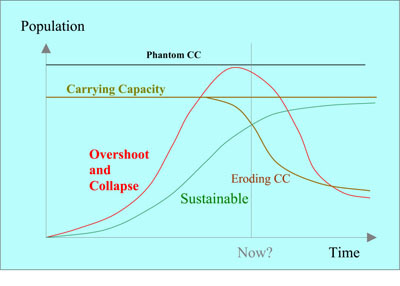 At present, technological props based on cheap oil have created a temporary, artificially higher CC that ecologist William Catton called “phantom carrying capacity.” Continued belief in this phantom can prolong the overshoot and erosion of real CC long enough to cause the population to collapse. Our present food system is operating at phantom CC. This is due to a level of agricultural productivity that is temporarily and artificially high because it relies on fossil fuels and other raw materials that are finite and fast depleting. Over 80 per cent of the energy on which our food system runs comes from oil. In practical terms this means that we are feeding more people than is sustainable (at least on a global basis), because human populations have ballooned in response to rising food production. Equitable food distribution is an essential response to the problem but is ultimately insufficient unless agriculture itself can be organized on a sustainable basis. On the other hand, human intervention can often rebuild CC and possibly improve it somewhat. Effective agroecosystem design can improve farm sustainability, for example, by building in sufficient species diversity to provide necessary farm inputs and ecological services “for free” to replace unsustainable external inputs to farms. Finally, “needs of a given human population” is a slippery term, the definition of which varies widely from one culture to another. We need to ask: How much material consumption does our quality of life really require? In regard to food, does discretionary consumption exist which, if reduced, could allow agriculture to feed more people? Low external inputs — Input self-sufficiency. Low emissions — Closed nutrient and carbon cycles that avoid losses of valuable resources that eventually cause environmental damage. Stability – Resilience – Adaptive Capacity — These qualities of sustainability are all necessary, but since they exist somewhat in tension, there must be balance among them. Stability is the quality that produces reliable results and minimizes risk, but in excess, stability can become rigidity. However, a certain flexibility is required for resilience, which is the ability to rebound from sudden change like a dry period in the farming season. Adaptive capacity to respond to slower changes like a gradually invasive plant disease also requires flexibility. Reserves of material or energy, overlaps, redundancy, or other slack in a system provide that flexibility, but at the price of efficient use of resources. Knowledge intensity — Reliance on technologies that are powerful but derivative of a narrow, specialist knowledge base will give way to a broader, more demanding knowledge of farms as complex ecosystems of interdependent species, a knowledge that enables the creation of biodiversity to capture synergies, to biologically control pests, for example. Management intensity — Farming for input self-sufficiency and low emissions will require more labor devoted to management planning and monitoring to replace other resources or use them more efficiently to maximize sustainable yield: productivity per acre. These principles fit well with the design imperatives of a future marked by gradual loss of sources of cheap energy. Aimed at maximizing the ecosystem processes described before, these design principles will guide the visioning effort. Contemporary models of large-scale conversion from industrial agricultural systems to localized, low input agricultural systems as in Cuba, the resources of the Permaculture and Transition Towns movements, and some of the more sustainable design efforts to develop very low external input systems in the organic agriculture movement. The design of each type of system will vary depending on its available resources, its appropriate role in feeding the county population, and its input support function for the other production categories. In parts two and three of this paper I will describe some general sustainable design considerations, and then build on them to offer a vision of each of these three food production systems. My effort is intended to build on earlier TCLocal articles relating to land use and food production. our food system will force the solution to some of our society’s worst problems. In addition to better food quality, the reduction of agricultural and other pollutants, and an increase in food security, the changes required for truly sustainable food production will rebuild community and begin to mend what Engels and Marx called the “metabolic rifts” in both our farms (e.g., broken nutrient cycles) and our communities (e.g., the broken connection between city and country, man and nature). These systems thinkers saw that the notion of metabolism that in biology refers to chemical processes and transactions essential to maintain life has its counterpart in ecosystems and social systems. Catton, William R. Jr. Overshoot: The Ecological Basis of Revolutionary Change. Urbana and Chicago: University of Illinois Press, 1982. Bennholdt-Thomsen, Veronika, and Maria Mies. The Subsistence Perspective: Beyond the Globalized Economy. London: Zed Books, 1999. Funes, Fernando et al. Sustainable Agriculture and Resistance: Transforming Food Production in Cuba. Oakland: Food First Books, 2002. Hopkins, Rob. 2008. The Transition Handbook. White River, Vermont: Chelsea Green Publishing, 2008. For a list, see the TCLocal archives (http://tclocal.org/archives.html). Thanks for preparing your piece on relocalization. It is a very important topic, as you know, and you are so articulate about addressing it. I am looking forward to seeing your follow-up work. In particular, any practical examples of an integrated and self sustaining farming community that functions well in our New York State environment would be quite helpful. Since there are not any great examples on the ground, any blue-prints on paper would make an excellent starting point !! The irony is that one is more likely to encounter self-sustaining agrarian communities on the periphery of the 'developed' industrial world than here in its center. Still, if anyone is aware of a community in the northeast that comes close enough to my described sustainability principles, I would be eager to study and report on it. A main obstacle in the US is the compromises imposed on farmers and communities by the need to plug into an economy that makes no sense in terms of sustainability. A striking example is the Amish communities, which I have admired and studied off and on for years. Although they thrived for a long time behind a partial self-imposed cultural firewall, the long term erosive efffects of being plugged into the external economy are now manifest, and their ideals are gradually succumbing to its pressures. Another example is The Farm, a large intentional community in Summertown, Tennessee that I visited and studied back in the early seventies, whose survival eventually required reorganization under less ambitious standards than the original ideals. In my view, what we are attempting in the TCLocal series are instructive visions, not detailed blueprints or plans, which can become quickly obsolete in the era of rapid change that we are entering. My goal is look for potential components for a vision in existent practices in farms and communities, particulary in our region, and adapt them into a vision that makes sense to me as a whole sustainable system. If you know of likely candidates, pieces of the puzzle that you think I should look at, please point me toward them. This is great! I think you have thought of all the caveats that invariably occur to me when I read an article on "sustainable" agriculture. I am writing to express gratitude. I have been studying permaculture and immersed in the transition town movement for the last 12 months. Based on all of that,I find what you wrote concise and inspiring in its conclusions. And all of that in just Part 1! I am thinking about a community wide project for Monroe County and the city of Rochester modeled on Belo Horizontale, Brazil, where they focused on ending hunger in the city using local farms to feed the population. (saw a description of this project in Mar 09 issue of Yes Magazine-article written by Francis Moore Lappe) I think a project like that, which could have strong emotional pull for many people (what would it be like to live in a city where people cared enough about one another to make sure no one went hungry?) could be a vehicle for popular education about the concepts you describe above and pave the way for social change. I am interested in increasing the social-emotional resiliency of the community as well and think this 'way in' might work. I would be interested in your thoughts on this if you are willing. Many thanks Karl. I look forward to your other articles!! This page contains a single entry by Simon St.Laurent published on July 25, 2009 11:32 PM. Can New York State Feed Itself? was the previous entry in this blog. Visioning County Food Production - Part Two: General Problem Areas in Sustainable Agricultural Design is the next entry in this blog.